The ProActive Resource Manager (RM) helps to deploy, administrate and monitor worker nodes. A worker node, also known as ProActive Node is a Java Virtual Machine process which can be launched on a variety of computing resources such as desktop computers, computer clusters or clouds. These worker nodes are used by the ProActive Scheduler to execute job tasks. It is also possible to launch multiple ProActive Nodes on the same host. It will allow the Scheduler to execute several job tasks in parallel on the host. This tutorial will show you how to start ProActive Nodes, add them to the Resource Manager and monitor their states. We will show you different ways to perform each step, by using different tools such as the Web interface, the REST interface or command line. You can access an online version of the Resource Manager at: http://trydev.activeeon.com/rm. Before you can create and add local ProActive Nodes to the Resource Manager, you will need to create a credential file. It provides a secure way to authenticate and authorise with the Resource Manager. Login here. Use the username and password you received by e-mail when you first signed up. On the Portal tab, click Create credentials. In the Create Credentials box, type Login and Password. Click create. Your credential file will start to download automatically. You will need this file for the rest of this tutorial. You have to provide the credentials that will be used, in the credentials box, click Choose Files and select the credential file. The nodeTimeout default should be increased to 60000. Type the maximum number of nodes in the maxNodes text box. For the Policy, the default settings are correct. They allow everyone to use it. You can also create and add local ProActive Nodes by using the RM REST Interface. Below is an example of a commandset to create and add local ProActive Nodes by using the REST Interface with cURL. Make sure you replace the credentials with the one you generated by the RM Web Interface (see the RM Web Interface section). 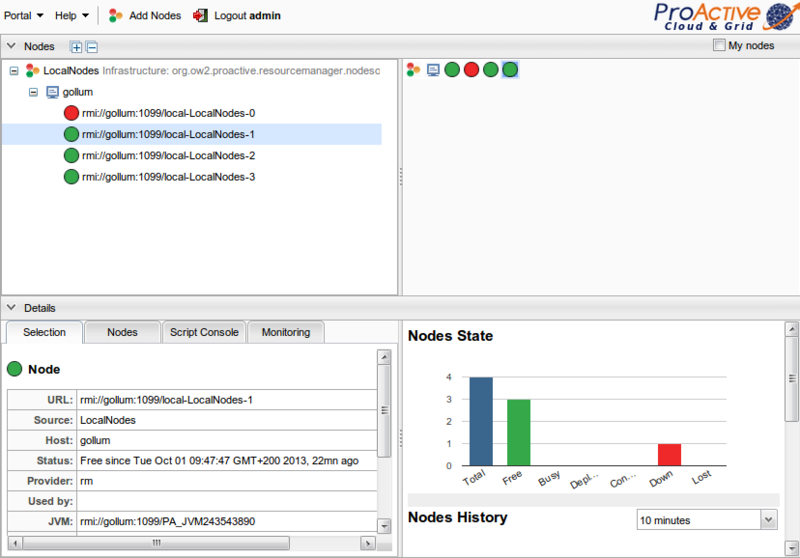 You will see 4 more local ProActive Nodes are added to the Resource Manager. You can login using login command, then you can create and add local ProActive Nodes using the createns command. Adding host machines of a cluster to the Resource Manager, typically involves unpacking the software on all those host machines. Then we need to determine which method that the Resource Manager can use to access the host machines in the cluster to launch the ProActive Node daemon. You can use the RM Web Interface to add remote ProActive Nodes to the Resource Manager just like you saw in the previous step. You will also need to create a credential file. See the RM Web Interface section in the Local Setup to know how to create a credential file. Click Add Node Source tab. Download this host machine list file. This file indicates that the resource manager will create more nodes on the host localhost. In the hostList box, click Choose Files and select it. In the rmCredentialPath box, click Choose Files and select the credential file you created in step 1 Local Setup. You will see ProActive Nodes from the cluster are added to the Resource Manager. 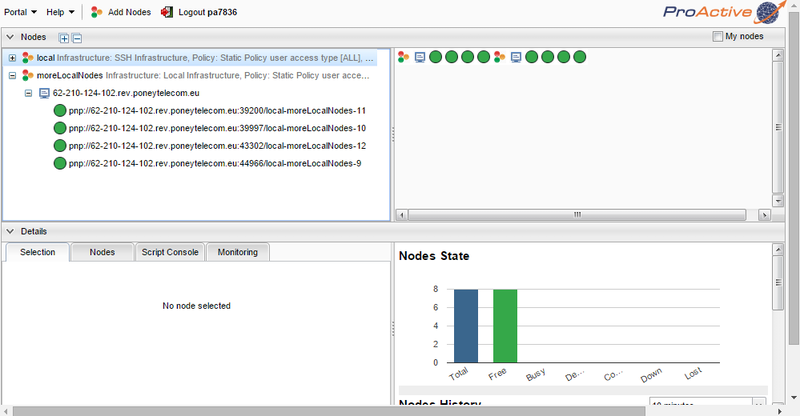 You can also create and add remote ProActive Nodes by using the RM REST Interface. Below is an example of a commandset to create and add remote ProActive Nodes nodes by using the REST Interface with cURL. Make sure you replace the credentials with the one you generated by the RM Web Interface (see the RM Web Interface section in the Local Setup). You will see more remote ProActive Nodes are added to the Resource Manager. You can login using login command, then you can create and add remote RM-Nodes using createns command. In this command, you should replace the file name cluster_setup_slaves with the path to your own file containing the number of nodes to deploy per host. Do not forget to replace also the path to your credentials file. The Web Interface of the Resource Manager is the easiest way to monitor its resources. In the following figure, you can see the list of nodes, their states, loads etc. 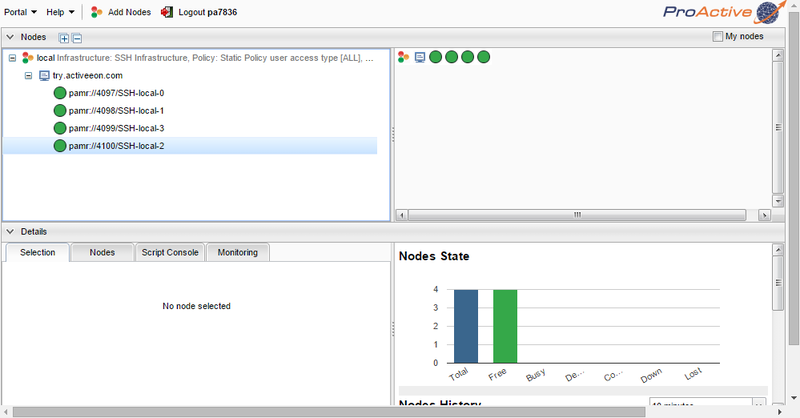 You can monitor the state and usage of the Resource Manager by using the RM REST Interface. Below is an example of a commandset to retrieve the state of the Resource Manager by using the REST Interface with cURL. This is useful for scripting. To discover more check out the REST API documentation. You can login using login command, then we can use the rmstats() and listns() commands to get some informations about the node and infrastructure. You can use the help() command to list all available commands. When you finish this tutorial, you can check out the documentation for more details.